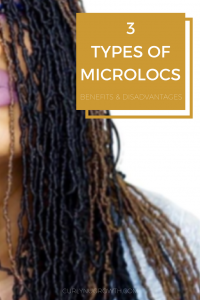 What Are The Different Types of Microlocs? 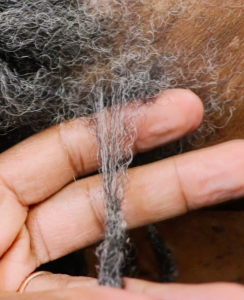 Microlocs are essentially locs that are smaller than traditional locs. On average that size of mature traditional locs are the diameter of a pencil. This means that the size of microlocs can vary from the diameter of a shoelace to the diameter of a drinking straw. Also, because of the wide range of sizing there are multiple ways to maintain microlocs. The most common methods for starting microlocs are with interlocking, braids or twists. 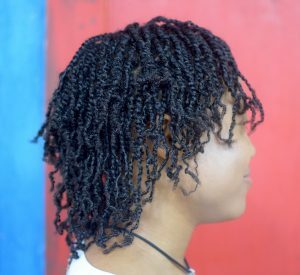 However, microlocs can also be started with coils but it is not common. Using the interlocking method to start microlocs is great for fine textured hair or for those that desire the smallest version of microlocs. Starting microlocs from braids is common when you have a long length of hair at installation or your hair texture is fine and twists will not hold. Microlocs started with twists are ideal for medium to larger sizes of microlocs and hold well for most textures of hair. 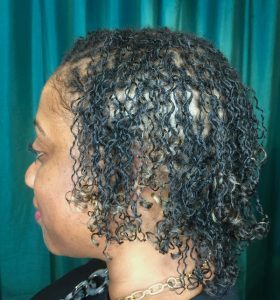 The benefit to starting microlocs with twists is, generally speaking, they’re large enough to be maintained with interlocking or Palm rolling. Microlocs are a great alternative to Sisterlocks and are often times much more affordable. In addition to the cost-savings, microlocs offer advantages such as versatility, neatness, and fullness. Versatility: The small size of microlocs often creates hundreds of locs, which means that the styling possibilities are almost endless. Neatness: Microlocs maintained with interlocking will stay neater for extended periods of time, compared to retwisting, because the sections are smaller, which means less frizz at the roots. Fullness: Microlocs generally result in at least 150-300 locs, depending on the size of your head and which size of microlocs you chose, therefore they will instantly create fullness and volume. 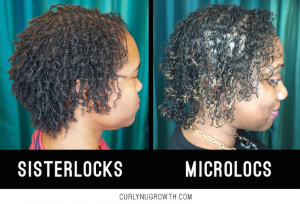 Are Microlocs Right For You? Active Lifestyle: You should consider microlocs if you have an active lifestyle and are interested in locs that will stay neater for longer periods of time and/or you enjoy shampooing your hair frequently. Cost of Maintenance: If you currently have a budget that includes paying for your hair (i.e. – going to the salon), you should consider microlocs either maintained with interlocking or palm-rolling. However, if you would rather maintain your locs at home, you should consider larger microlocs that you can maintain with palm-rolling. 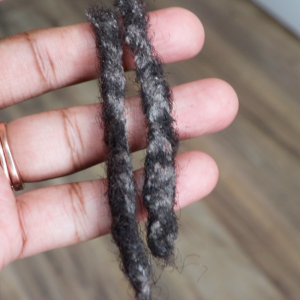 Time for Maintenance: Generally, microlocs result in over 100 locs and the time necessary to maintain that amount of locs can be a lot, especially if you’re interlocking. You have to ensure that you can commit to that amount of time (typically 6-8 hours minimum) every few months. Volume & Fullness: The more locs that you have, the less likely you are to see a lot of scalp being shown, which creates fullness to the hair. So, if your goal is fullness, microlocs are definitely an option to consider. Interested in Sisterlocks: If the size of Sisterlocks are too small, but you like idea of smaller sized locs, microlocs are a great alternative. What type of microlocs would work best for you? I’m considering micro locs because sisterlocks are totally out of my budget. And then the cost per hour for retightening every 4-6 weeks on top of that? I can’t. Sisterlocks are soooo beautiful to me, but I cannot afford that. Micro locs offer the same look with the option of fuller locs and I like that because I want the fullness. Thank you for this article, it was very helpful as I look for alternatives to sisterlocks. No problem Sonya! I am glad that you found it helpful! 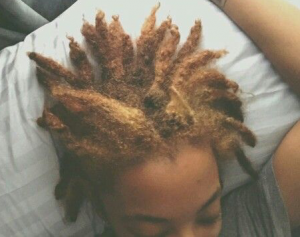 Best of luck with whichever set of locs you decide! Hi I have traditional locs at this time and I’ve had them for all most 4 years. My question is I would like to take my traditional locs down and start a journey of micro locs. After taking the locs down how long is good to give your hair a rest before starting another style of locs. I have discovered that the traditional locs can be heavier on the head and neck especially when it is wet. And also I would like to get a price range for how much micro locs would cost me. If your locs are overly heavy, you may have excessive product buildup contributing to the weight. There is no set time for “resting” in between new locs because the starter locs do not have any weight and will be light. Price range will depend on your area, the skill of your Loctician, and starting method (twists or interlocking). Yes you are very wrong. You are going to cause thinning from the addition of braiding hair. With all locs you will see scalp, the hair is parted. Please stop immediately. hello! 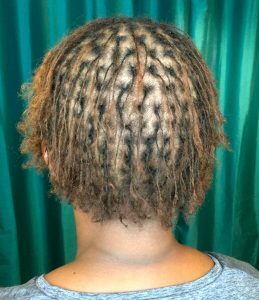 what are the primary differences in sisterlocs and small Microlocs? The main difference would no longer be in the sizing but rather the interlocking pattern(s) used which would produce a different looking loc. Sisterlocks utilize multiple patterns unlike regular interlocking/microlocs. Hi I just got my sisterlocks a month ago and want to have some hair added don’t like the length of my hair and the person that put them in say she don’t like the add should I fine some one else to do them. You canNOT add extensions to Sisterlocks, they are too small and will break off and/or cause thinning at the roots. I’ve seen it first-hand. Embrace your hair at all stages and it will grow. Don’t cover it or add any extensions. I had traditional locs. I cut my hair short, because I have thinning at the crown. But I want locs and do you think micro locs would be better. I’m so self conscious about my thinning top. I think that you should address the causes of the thinning and stop it before starting another set of locs. Visit a Dermatologist or Trichologist in your area. If you’re interested in learning more about Microlocs, you can definitely setup a one-on-one training class. Just send me an email!